Although The Lord of the Rings has many similarities to the epic sagas of the Middle Ages, the book does depart from its medieval counterparts in one aspect: The chivalric romances of old always featured a mighty knight or warrior as their protagonist. In The Lord of the Rings, however, the hero is a hobbit — a humble, even timid character who has no love of glory, and who would rather enjoy a bountiful breakfast than go on an epic quest. Unlike Galahad, Roland or Beowulf, Frodo Baggins represents the universal “everyman.” Although he may daydream of far-off wonders and grand adventures, his life is filled with the details of tending his garden and dealing with neighbors and relatives. Does this mean he cannot be a hero? Similarly, each of us may fantasize about saving the world, or battling evil, or ruling a mythical kingdom, but we probably have far more in common with Frodo than we do with Gandalf or Aragorn; every day we tend our business, deal with our neighbors and friends, and wonder what’s for breakfast tomorrow morning. But does this mean we cannot be heroes? 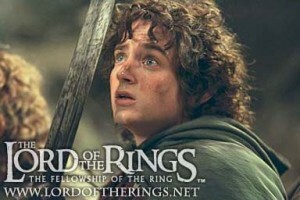 In asking this question, we find that The Lord of the Rings has crossed into the realm of Chivalry Today. There are unpleasant, difficult and frightening jobs which need to be done every day, and we, like Frodo, must be willing to undertake the tasks which fall to us, not because they will bring us glory or riches or titles, but simply because they need doing. That is what courage and chivalry are all about. That is what makes someone into a knight in shining armor. Just one of the many statements penned by J.R.R. Tolkien which reminds us why The Lord of the Rings is a true classic, and a great reminder of the need for Chivalry Today.